I hadn’t realised quite what an effect the Martha Gellhorn book had had on me till I started casting around for the next thing to read – and realised that I had a bit of a book hangover and really, really needed something in total contrast and something that would be a bit more feel-good – enter Beverley, to the rescue! “Death to Slow Music” is the third in his detective series, featuring Horatio Green, and it was the first one I actually owned – and isn’t the cover just gorgeous! The mystery is set in the coastal town of Seabourne, where a gruesome discovery is made in the Ghost Train on the Pier. Superintendent Waller and his faithful sidekick Bates are called down from London; and fortunately Mr. Green, accompanied by his niece Charlotte, is on hand! The murdered woman is the wife of the man in charge of the pier’s slot machines, and initially there seems to be little motive. 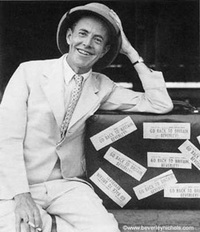 However, there is the hint of a connection with ‘show people’ – in the form of Nigel Fleet (the Noel Coward of his age) and his musical genius Julian Doyle. Then there is Sylvia Lincoln, an ageing diva who can no longer hit the notes; Christine, a clairvoyant and amoreuse of Fleet, who cares for her slightly disturbed brother Robin; and Lord Lancing who is backing the show financially and whose main interest is Sylvia. Add in the somewhat smooth and sinister local doctor, Mickleham, and you have the recipe for a wonderful thriller! And wonderful this certainly is! Of the three Horatio Green mysteries I’ve read so far, this is definitely the best. Nichols seemed to be getting into his stride with crime fiction and the plot is very satisfying. I only had a slight glimmer of what might be the motive, but there were a number of twists and turns, plenty of dramatic happenings and enough confusion to keep me thoroughly fuddled until the end. The characters were a beautifully varied lot, and Charlotte had a bigger role in this story than in previous ones. Once more music was of great importance to the storyline, and Mr. Green’s olfactory skills came into place as usual. “It was two days later, and they were sitting in a corner of The Nell Gwynn Parlour at the Grand Hotel – so named, presumably, because its principal decoration consisted in a dado of diseased oranges”. What a lovely comfort read and palate cleanser! Sounds like great fun! I loved it – but then I am a bit biased when it comes to Beverley! I remember Nichols as a frequent and outspoken guest on talk and panel shows when I was a child in the fifties and I had no idea that he had also written fiction. I’m not sure if I can get past the memories I have of him as a blatant show off to try and read these, but you make them sound so darn good that I may just have to get over my prejudice and try them. I’m sure he *was* a terrible show off and probably insufferable in real life. But on paper he’s just wonderful! I liked the sound of this series already, but with a seaside town and a strong plot this may tilt me into a little book-shopping. It’s probably my favourite of the series so far, I have to say! I’ve bought one – Crazy Pavements. Have you read that? I have! And reviewed it somewhere on here! It was the first Beverley I read and although not a crime book it’s a great novel set amongst the Bright Young People! Hope you enjoy it! 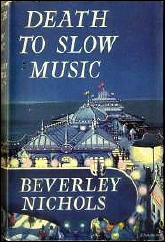 Oh I really must find these Beverley Nichols mysteries they sound brilliant. I haven’t read a Beverley detective story yet – I think this would be perfect for the summer holiday! I’m still hoping to come across one of these as they sound delicious. Speaking of which, I recently found a copy of Nichols’ ‘Down the Kitchen Sink’, which from my flipping through sounds brilliant and witty (but what else should I expect?!). I’ve already read a few of his books, and I bought this one in London a couple of months ago. It’s now at the top of my TBR pile! It’s a fab read and if you like Beverley you’re definitely in for a treat! I think maybe I’ve been reading too many of the usual mystery writers. I kept thinking, “That’s not how the police would work!” I do like his style but the structure was just a little off for me. And I really didn’t want the killer to be who it was. I will, of course, continue reading him. I found “Self” in a shop in Belgium last month. Maybe that’s what I liked about him! I’ve read so many murder mysteries that I like it when someone plays with the genre – plus frankly I could read anything he wrote because I love his style. Though oddly enough I haven’t read Self yet, which is on my pile! i really want to read these books but i can’t seem to find them online 😦 could you please tell me where i can find them? Unfortunately, a lot of Beverley’s books are out of print, including these – so it would just be a case of searching second hand sellers to see if you can find them. thank you so much for the info! I’ll look around.